This beautiful munchkin picked out her own outfit for her portrait session and her Mom couldn't resist. With that sweet, innocent smile and sparkle in her eyes, she reminded us both of a LaLaLoopsy doll. 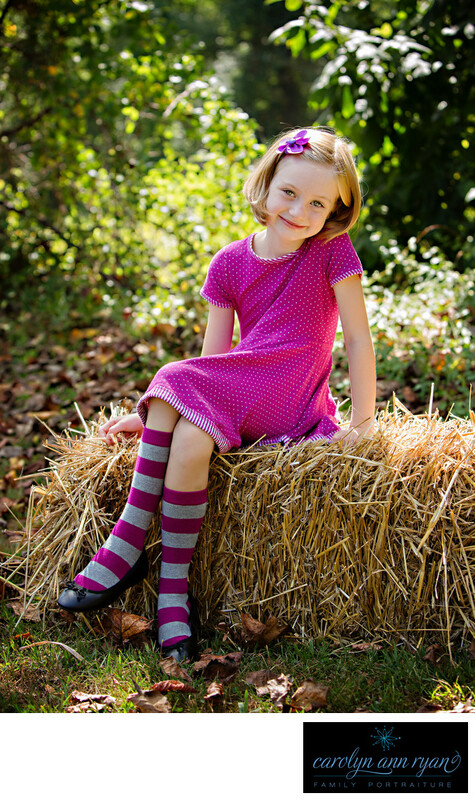 I absolutely adore her combination of striped socks with a polka dot dress and matching headband. It was that perfect mix of quirky and adorable. I think this little lady has a future as a fashionista, and from the stories I have heard from Mom, she loves shopping for clothes. The addition of the bale of hay was just perfect and gives this photograph a little taste of quaint, timeless and country. This family's portrait session was scheduled just days before school began, so it also made the perfect Back to School portrait for Mom.Keywords: back to school (12), girl (39), girls (165), grey (6), hay (3), LaLaLoopsy (3), pink (57), polka dots (18), stripes (3). 1/125; f/4.5; ISO 125; 70.0 mm.